Please join members of Children's Magical Garden, Tuesday, April 9th at 7:30 am for a Press Conference--Public Outcry, at 29 Stanton Street between Norfolk and Essex. Show your support of this beloved community garden that is under dire threat. Your presence will help protect this children’s garden. Members of Children’s Magical Garden were heartbroken and outraged to discover as they came to the garden on Sunday that a trespasser had illegally broken into their property and senselessly destroyed many of their treasured plantings, including their mature and flowering nectarine tree, elderberry bushes, butterfly bushes (which attracted monarch butterflies to the garden each year), mature boxwoods, and perennial flowers. The Children’s Magical Garden is beloved and historic community garden founded in 1982 at the corner of Norfolk and Stanton Streets on the Lower East Side. More than three decades ago, the Garden’s founding members transformed the site of a burned down building that had become a dangerous dumping ground across the street from P.S. 20 elementary school into an enclosed garden sanctuary, where children could safely play and learn about nature. 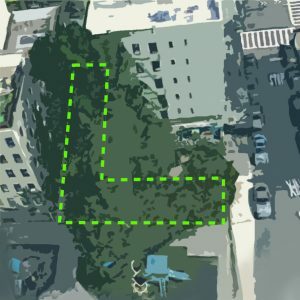 Recognized by the New York City Council as a “neighborhood treasure,” and for its “vital role in transforming the Lower East Side environment,” this non-profit community garden has given mentorship to thousands of children and inspired a connection to nature for generations of New York City residents. Yesterday’s attack against the Garden is the latest escalation in the Garden’s six-year battle defending its property against developers David Marom and Serge Hoyda. For years, David Marom and his business partner Sam Yaari have sought to seize part of the Garden’s land and bulldoze it to build a seven-story private luxury apartment building that would be inhabited solely by Marom and Yaari’s adult children. In 2014, the Garden was forced to file a lawsuit against the developers in New York Supreme Court after they broke into the Garden’s lot with a construction crew and team of armed security guards, where they trampled and destroyed the property and built a fence preventing children and community gardens from accessing roughly half of the Garden. Despite public protests and repeated calls and letters to the developers by members of the New York City Council, the principals of all four neighboring schools, a petition signed by 2,500 community members, and a resolution by Community Board 3 in support of the “beloved community garden”, the developers have refused to work towards a peaceful resolution that returns the property to the Children’s Magical Garden. The Garden will not be intimated by violence and threats by these developers, and fully expects that New York Supreme Court will declare the Garden the owner of its land and award damages against the developers for their repeated, violent trespasses onto the Garden’s property that threaten the safety and well-being of the children and families that use and rely on this important community garden. The Gardeners are concerned about this latest attack against their property and what David Marom might do next. Gardeners are asking the community to call their representatives and let them know what the Children’s Magical Garden means to them. Spread House Cafe: 116 Suffolk Street between Rivington & Delancey).